Despite the fact that the War of 1812 was a near three year clash between the United States and Great Britain, it was arguably the British North American colonies (what is now Canada) that were most profoundly altered by the conflict. At the time, mainland Nova Scotia and Cape Breton Island comprised two of Britain’s colonies, and although the majority of the land battles took place in Upper Canada (now Ontario) and the United States, maritime and other aspects of the war affected Nova Scotia and its people. Beginning in the summer of 2012, and continuing throughout 2013 and 2014, a variety of commemorative events have been taking place across the country to mark the 200th anniversary of the War of 1812. In Nova Scotia, institutions and organizations such as the Halifax Regional Libraries, Citadel Hill National Historic Site, Saint Mary’s University, the Maritime Museum of the Atlantic, St. Paul’s Church and the Old Burying Ground, Liverpool Privateering Days, and Dalhousie University, have helped citizens discover the significance of the war by hosting talks, exhibits, re-enactments, displays, public programs and commemorative ceremonies. This resource will present an overview of the major effects the war had on Nova Scotia, will suggest further resources for more in-depth information, and will highlight various commemorative activities in the province. What was Nova Scotia’s role in the War of 1812? Starting on June 18, 1812 and lasting for nearly three years, the War of 1812 was a series of land and sea battles between the United States and Great Britain, including their respective First Nations allies. The war was fought in three principal theatres: first along the American-Canadian border (primarily along the Great Lakes and Saint Lawrence River); second, along the American South and third, and most relevant to Nova Scotia, the maritime component along the Atlantic coast of the United States. In 1812, the advantages lay with the Americans who won several spectacular single-ship actions. Both sides launched an aggressive privateering campaign and trade through Nova Scotia boomed. In 1813, the British naval presence increased as additional ships were sent to Halifax and a blockade of the American coast was implemented. This year also saw one of the war’s most memorable naval battles, the capture of USS Chesapeake by HMS Shannon. By 1814, the Atlantic seaboard was dominated by the Royal Navy and American trade was dwindling. There was an increase in British raids, including the occupation of the Castine region of Maine and the capture and burning of Washington D.C.
As the war progressed, there was an increase in privateers and naval impressment. 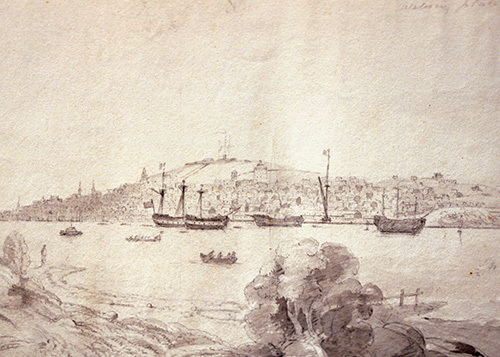 The Halifax Naval Yard and military presence grew in response to the battles at sea, while a prison for captured Americans was maintained at Melville Island. 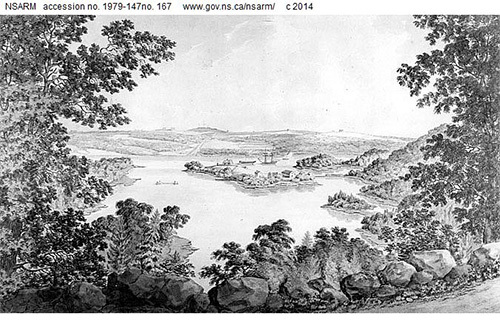 It was with the end of the war in 1814 that Nova Scotia would be most permanently affected. This period saw the arrival of the Black Refugees, discharged military personnel making the colony their home, the economic benefits of the Castine Funds, as well as the many graves, monuments, and buildings that today stand as a testament to the War of 1812’s people and events. The Nova Scotia Archives provides a collection of archival resources related to the province’s involvement in the War of 1812 , as well as a collection devoted to the “Acadian Recorder”, a weekly Halifax newspaper that began in 1813 and regularly featured news about the War of 1812. Beginning in July 2014 and running until October 2014, the Maritime Museum of the Atlantic will host “1812”, an exhibit produced by the Canadian War Museum. The Canadian Encyclopedia’s overview of the War of 1812 includes a section about the 1812 campaign in the east. The “Atlantic Campaign of the War of 1812” is an overview of the maritime component of the war, presented by the Historica-Dominion Institute, The Royal Canadian Geographical Society and Parks Canada. Beginning in 2012 and taking place throughout 2013, the Citadel Hill National Historic Site hosted public programs about the War of 1812, including “Tall Ships Nova Scotia 2012” and “The Halifax Defenses: the forts that protected a navy that defended an empire”.